1. Why did you walk the Camino de Santiago? This question made me nervous because I didn’t know how to answer. I’m not believer in a tight sense. 2. When did you decide to walk the camino? I started to think about it in October 2005. I bought guides, and the rest of the information via the internet. It took me until spring this year before I start walking the camino. In early April, the idea of the camino restarted in my head, so I went to Rail Europe and bought the ticket train. I had this sudden strange determination, and this is the first time I took such an impulsive decision. 4. Did you find what you are looking for? If not, what have you found? Yes I did, I think I have found what I was looking for. I lived more than a month in simple and healthy way. 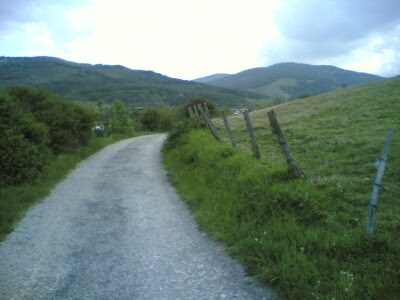 I stopped my usual routine to do the camino, and it gave oxygen to my soul. Plus I met extraordinary people. 5. Rome (Vatican) is just around the corner for you, have you ever thought of doing a pilgrimage there? I was just looking at the information on Via Francigena, that began in Canterbury and ended in Rome. The problem with this route is that the way is only partially signed (no yellow arrow), few albergues along the path, no pilgrim-menu, and it could be very expensive. This path is not according the pilgrimage philosophy, but something is moving in the last months, and people has began to walk this path. 6. Knowing that the Italians are particular about their food. How do you find the food in Spain? Good food is very important for most of Italians, not for me. I have found Spanish food very good, well cocked, just the right quantity, and lots of variety. Overall it's very good, especially with vin tinto. 7. Do you have plans in the future for another pilgrimage? I don’t know, I’m tinkering in my mind on the French branch of the camino “La via Podense” from Le Puy en Velay to St. Jean P.P. We’ll see. 8. Finally, since Mike mentioned that you are his trainer in the camino, do you have any advise for would be peregrino? a.) Make sure the weight of the rucksack does not have to exceed 15% of the body weight. Technology can help us as dresses, towels, socks and polar are very light. Every kg we carry are discharged on our feet and this increase the potiential problem, i.e. blisters. The weight is also a common cause for tendinitis. b.) Shoes. They must be fully tested (not new), must have a sole thick "Vibram" type for difficult ground. They must be bigger than normally shoes. Usually I have 36 (EU size) but 38 for walking. c.) Socks. Must have excellent micro-fibre, soft inside so they can move the sweat outside, and absolutely not to use the sponge socks! The humid sponge becomes hard and cause of blisters. d.) Lastly, walk slowly in the morning. This gives your body time to wake up! And for you Evan: Never throw the “spaghetto” against the kitchen tiles to verify the cooking is “al dente” because if the “spaghetto” stick up on the tiles the “pasta” will be horrible.